Why not carry a bit of that Halloween fun over into Longbox Junk? This month, I'll focus on a few spooky, creepy, and otherwise Halloweeny comics floating around in my collection. Let's start this off with some one shots! DC Universe Halloween Specials from 2008, 2009, and 2010. Plus the DC Infinite Halloween Special, DC House of Horror and the odd man out. . .the Marvel Zombies Halloween Special. Since these all have multiple stories in them (a couple have THIRTEEN), I'm going to post them separately as the month goes by. . .AND I'm going to throw in a couple of mini's as well. HAPPY HALLOWEEN! 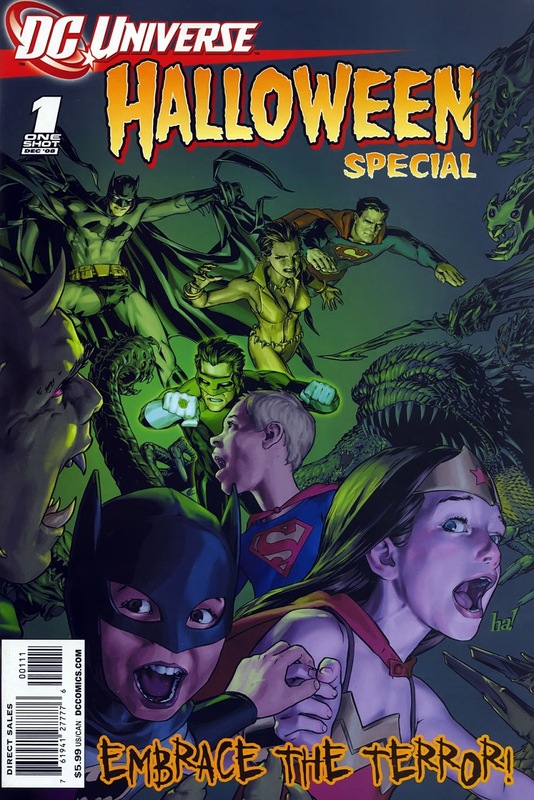 What we have here is one of a series of Halloween Specials that DC put out for a few years. They had a pretty hefty price tag, but on the other hand DC packed these specials to the brim with stories. There's 9 stories in this one, so there's a lot of ground to cover. Let's break it on down. . .
On Halloween night Clark Kent gets help making a deadline by the ghost of a reporter haunting the Daily Planet trying to finish his last story so he can rest in peace. Green Lantern Kyle Rayner is tortured by horrific visions of everything that he fears as he tests himself to prove that he's worthy of being a Green Lantern. A re-telling of The Legend of Sleepy Hollow with Jonathan Crane taking the place of Ichabod Crane and Batman taking the place of the Headless Horseman. It turns out to be a hallucination after Scarecrow accidentally dosed himself with his own fear toxin. When Sebastian Faust is brought in as a consultant on a case involving magic and missing children, he finds himself drawn into a trap that frees his father, Felix Faust, from a magical prison. Two boys go into the sewers to find a missing key and encounter Batman fighting Solomon Grundy. An extremely weak story that serves mainly as a showcase for the awesome Darick Robertson artwork. An extra point for that great art squeaks this one to a 3 OUT OF 5. Two damned souls trick or treat in Hell under the watchful eye of The Demon. The inmates of Arkham Asylum have to fight for their lives against a Werewolf. Vixen's night at the movies is ruined by a magical projector that brings the monsters off the screen and into the theater. Ralph and Sue Dibney use their ghostly powers from beyond the grave to solve the case of a murdered woman and a stolen inheritance. If I would have paid $5.99 + tax for this Halloween Special back in 2008, I would have definitely felt ripped off. Out of nine stories, only 3 were good. The rest felt like filler and artist showcases. And even the few good ones weren't particularly scary or spooky in any way. The only consistently good thing about this comic was the art, which was great on every entry. If I had to describe this comic in one word, it would be: Disappointing. I expect more from something packing a 6 dollar price tag. 13 more short Halloween stories in the DCU 2009 Halloween Special. Hopefully, there will be a bit more meat on the bone for the price they charged. Be there or be square! I'm also a lover of October in general and Halloween in particular. I wasn't collecting comics when this one came out, so I missed it, but will be cautious on how much I spend if I run across it in a back issue box. Thanks!